Why slave away over the grill for your next summer barbecue? This space-saving homemade warming rack can half your grilling time—and is doubly fun to build! From searing a steak to piecing together the perfect kebabs, manning the grill is a juggling act. For BBQ-ers without a built-in top rack for buns, melting cheese, and cooking veggies, a simple Labor Day cookout requires precise timing, coordination, and creative use of limited space. 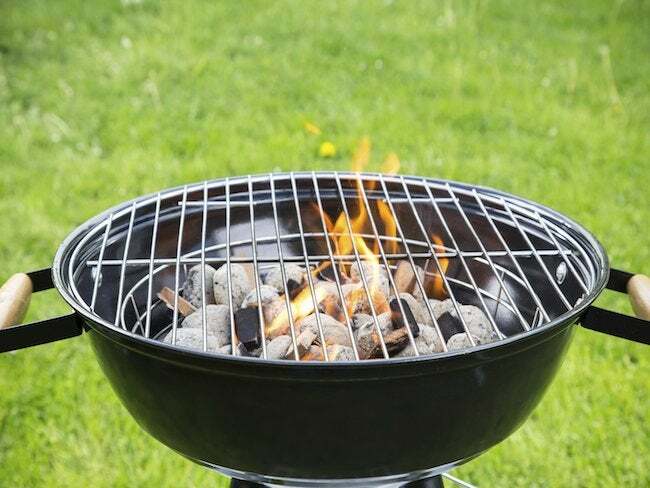 Even if you’re blessed with a two-tiered grill, hosting a family get-together or a tailgating party usually calls for even more cooking room. Whatever you’re working with, the problem is the same: Put side dishes on too soon, and you might not have space for the main entrée—but, wait until the entrée is fully cooked to add the sides, and you’ll have to serve cold burgers and dogs to hungry guests. For those in the same BBQ bind over the holiday weekend, Joshua Bousel of Serious Eats devised a DIY grill add-on that warms finished food and doubled his cooking space. The grilling gastronome’s rack rose from humble beginnings: two rinsed tin cans, to be exact. With both ends cut off and the labels removed, Bousel stood the two containers upright on his charcoal BBQ. 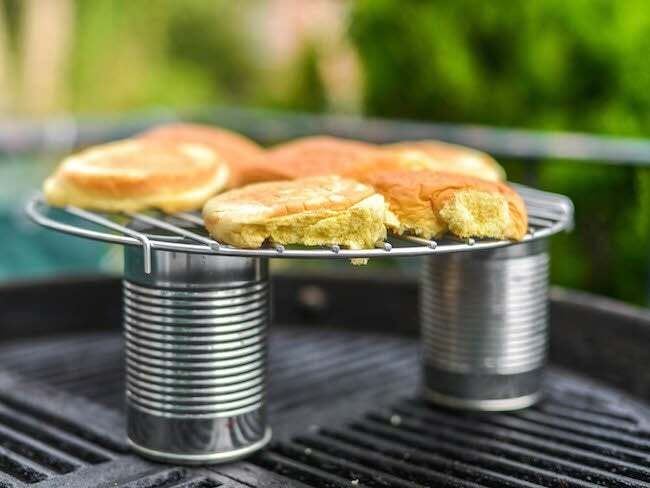 He then rested another circular grate (an oven rack or a stove burner will work, too) right over the cans. Removed from the blazing heat of the flames below, the second level serves as a standalone warming rack for finished food. Or, covered with foil, the top tier works as a a slow cooker by evenly roasting potatoes, corn, and other seasonal veggies without burning them. Best of all, this free BBQ booster leaves plenty of room on the bottom for more food. With all of the extra space, you’ll be able to throw everything on at once, essentially cutting cooking time in half and getting you back to the party sooner.